Under your dog's Profile Page click "Edit Dog"
Copy the embedded code from Hulu, YouTube, etc. MyShoDog.com is a FREE social networking site built for Breeders & Owners of dogs competing in Conformation, Agility, Obedience, Tracking, Herding, Rally, or any other competitive arenas sanctioned by recognized canine registries (such as the American Kennel Club, Canadian Kennel Club, United Kennel Club, Australian Shepherd Club of America, The Kennel Club, etc.) 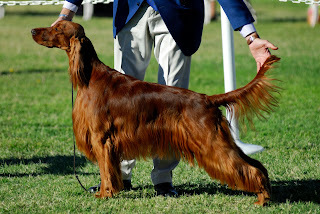 in order to showcase their dogs via photos, videos, pedigrees and Announcements. Our Profile pages consist of two categories "Breeder/Kennel" and "Dog" as we see this site as a network to showcase the dog rather than the individual. In addition to the ability to easily upload photos, videos and pedigrees, we created simple and streamlined communication tools that allow users to easily post Best of Breed, Group Wins or Best in Show Announcements, High in Trial Announcements, etc. Once posted Announcements are automatically sent to the Dashboard of any registered user that has clicked the "Follow" button on your Profile page. You can also use the "Share" button to send a link of your page containing the Announcement to your email account and addresses, Facebook account, Twitter account, etc. Because our Profiles are public announcements are also visible to the general public. MyShoDog.com is still in a beta version so please let us know your thoughts on the site whether it be suggestions for improvement, new features to be added, etc. by using the "Contact Us" page. Please watch for future upgrades and changes still to come from MyShoDog.com. 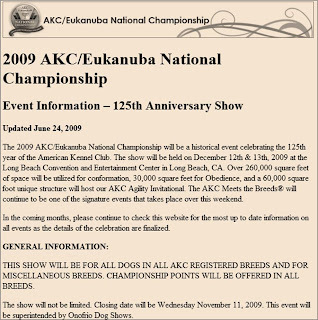 In honor of the 125th Anniversary, the American Kennel Club has opened the AKC/Eukanuba National Championship to all AKC Registered dogs - no limits set on this traditionally selective show. We send congratulations and share in the pride of the 125th Anniversary of the American Kennel Club and we are looking forward to the AKC/Eukanuba National Championship! We wish all competitors the best of luck.